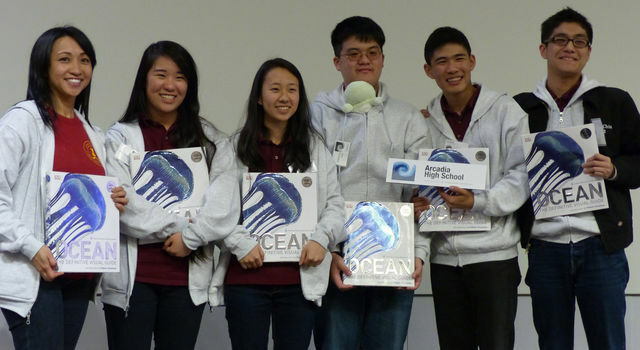 Arcadia High School took first place at the Ocean Sciences Bowl regional competition at NASA's Jet Propulsion Laboratory in Pasadena, California, on Feb. 28. The team consisted of four main players, an alternate and a coach. They beat out 11 other teams from California high schools, and won a trip to the National Ocean Sciences Bowl finals in Ocean Springs, Mississippi from April 23 to 26 at the University of Southern Mississippi Gulf Coast Research Laboratory. A team from Santa Monica High School won second place, and Francisco Bravo Medical Magnet School, Los Angeles, came in third. Questions touched upon biology, chemistry, geology and physics of the oceans, as well as navigation, geography and related history and literature. A variety of aquatic facts -- such as, which of the Great Lakes is the deepest and coldest (Lake Superior) and how many seaports are in the United States (361) -- arose in the final rounds. This is Arcadia's third year in a row winning the regional "Surf Bowl." It's clear that students take it seriously: Arcadia captain Kathy Lee, a senior said her team meets for two hours twice a week to practice throughout the year. "We have our own buzzer set," she said.